Government employees aren't necessarily covered in Social Security so they may or may not be taxed for it and eligible for benefits. The document titled Social Security: Mandatory Coverage of New State and Local Government Employees has specifics on the percentage of government employees people who are in the program. Turns out that the large majority of them are in SS. Only 27.5% of state and local government employees are not in Social Security. Half of the states have over 90% of employees in SS. Only 7 states have less than 50%. I got the room and board costs off the College Boards site page for published prices at national level. Specifically the Tuition and Fee and Room and Board Charges over time table 2. I had to figure the room and board cost by taking the total cost for tuition, fees and room and board and subtracting the cost for just tuition and fees since they didn't have an individual figure for just room and board. I'm showing the numbers for public four year universities here. However I looked at private schools and the trend is pretty much the same but private school room and board costs a bit more. From the chart it looks like the growth rate has been similar, but not really. Tuition started at $428 a year in 1971 and housing was $977. Now as of 2013 school year tuition hit $8893 and room and board was $9498. Tuition is 20 times as much and room & board is not quite 10 times as much. Again that doesn't look hugely different but 7% growth adds up a lot more over the years than 5% does. 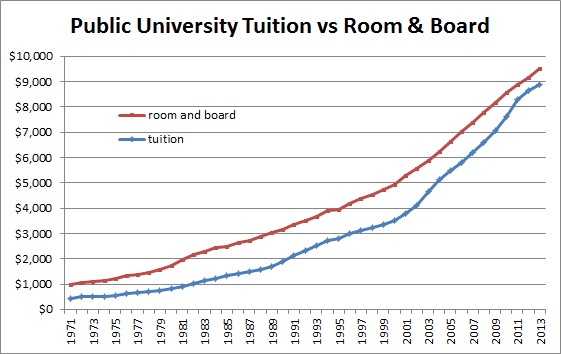 Room and board has gone up faster than inflation but not as fast as tuition. A large portion of the cost of room and board is the real estate. You might have noticed that housing has gone up in the past few decades and even with the crash a few years ago real estate has grown faster than inflation over the past 40-50 years. We can look at housing costs two ways, comparing to the cost of rent or the cost of housing. I got both from the Census for the 1970, 1980, 1990 and 2000 years. Historical housing cost and rent cost. Unfortunately the college room and board figures only go back to 1971 so I'm comparing hosing costs from 1970 to room and board from 1971. Close enough for an idea but not exact. Generally the cost of room and board has grown at a similar pace as rent and home values. Over the longer period from 1970/1971 to 2000 the cost of room and board at 4.2% has not grown as fast as either rent at 4.4% or homes at 5%. Of course a sizable % of the cost of room and board is in the food served to students. However I don't know what % of the cost is typically housing and what % is food, so I can't break that apart. Bottom Line: Room and board has certainly gone up over the decades and faster than inflation in general. However it hasn't gone up as fast as tuition and the growth in room and board has been more on pace with the change in housing costs. Some good stuff there. Discovers 'online shopping' is usually the best 5% category of the year since it covers any online shopping site. I believe exceptions are things like money transfer like Paypal or utility payments. Plus theres plenty of coverage for department stores if we decide to do some shopping at department stores. We don't buy too much at that kind of store but something might come up particularly with Xmas shopping on the horizon. Citibank has a $300 annual cap on the cashback. Discover and Chase applies to $1500 per quarter in purchases. 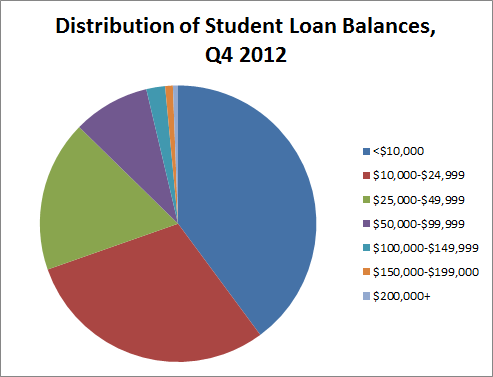 The Federal Reserve Bank of New York published a Student Debt Overview and on page 10 they have a chart of the distribution of student loan balances. The numbers are a couple years old now and probably grown a bit since then but not drastically. Note that the chart includes all borrowers including people who went to grad school and professional school like law school and med school. So the larger balances are going to be mostly people with professional degrees like lawyers and doctors and there are much fewer people with just a bachelors degree who have 6 figure debts. FMF has been one of the consistently good all around finance blogs. If you haven't read it then go check out their archives. He has a lot of great stuff on growing your career. If you have student loans then its likely you're paying 6.8% or more in many cases. Social Finance or Sofi.com is one option to refinance your student loans. They advertise variable rates starting at 2.66% and fixed rates starting at 3.625%. That will beat a lot of peoples current student loan rates. However the rates are based on your credit and profile so it could be higher. They cite maximum rates of 5.285% variable or 7.740% fixed which are still better than a lot of private loans. But it won't work for everyone. They only loan to students from certain schools and you do have to have decent credit. You also must be employed or have a current job offer. And you must currently reside in one of the eligible states. Their list is most states but its NOT available in Alabama, Delaware, Idaho, Mississippi, Montana, Nevada, North Dakota. I have not been able to find specifics of the criteria like credit score or a list of schools on the Sofi website itself. Sofi says you must be a graduate of "a selection of Title IV accredited universities or graduate programs". Thats not specific at all. I found one reference to them lending to grads of about 100 schools but that was about a year ago and they may have expanded the number. I found a list of eligible schools at a 3rd party site, but I don't know if its current or accurate. The list of schools looks legit though but again it may be out of date. Since Sofi's model has been to deal with schools that have low default rates so you could generalize that only the better schools are likely to be covered (sorry University of Phoenix grads). You can look up default rates by school at this site and if your school is very higher then they may not be covered or you may be offered a higher interest loan. Note I don't have any specific information on how Sofi decides to approve loans or determine rates. I'm inferring some from descriptions of their business model mostly. The downside to doing a refinance is that you lose access to programs like the government IBR and loan forgiveness. So thats something to consider. You might not get great terms from Sofi either. I've read reports of people with credit scores in the high 700's and good paying jobs getting offers of 6% loans, which isn't all that great. But if you do have high interest student loans then looking into Sofi.com might be worth your while. If I was to take a guess I'd assume probably something like 5-20% of people move to another state after they retire. I mean doesn't half the state of New York move to Florida on their 65th birthday? Well no. As it turns out only about 2% of retirees even move out of state. "In 2010, just 1.6 percent of retirees between age 55 and 65 moved across state lines, according to an analysis of U.S. Census Bureau data by Richard Johnson, director of retirement policy research at The Urban Institute." If I think about all the people I know who have retired, I can only think of one couple that moved across state lines. Everyone else I know has stayed put. My family all lives in the state I grew up in and I'd consider moving. However if I end up living in my current state for very long I will probably have developed enough roots here that I'd probably stay put. All three options do require you to pay regular income taxes on the money. The problem with #1 can be that this large lump sum of money can easily move you up into a much higher tax bracket and you'll owe significantly more money in taxes than if you spread it out over time with the Inherited IRA. About six years ago now I wrote about saving money with a smart power strip. One of the details in that article was "The 19" TV uses 8 watts while off." I've still got that 19" TV. We don't really use it. But its been moved to another location and is no longer plugged into that smart power strip. So it sits there doing nothing day after day collecting dust. Its almost always plugged in because .. well I'm just lazy or forgetful and don't remember to flip off the power strip on/off button. My wife occasionally watches DVDs on it as well so she might turn it on once in a great while. Though I can't recall when she watched one down on that TV. We've got a 55" TV in our media room so theres little reason for watching a movie on the 19" TV. That 19" ancient CRT I've had for around 20 years now is costing me about $7 a year in electricity while its off. 8 watts power usage while off is going to add up to about $7 in electricity for a year. I should really get rid of that old TV. Or at least unplug it. I saw a mailing the other day for a The Disney Movie Club. Its similar to the old Columbia movie club or BMC record clubs You get a bunch of discs for cheap up front then you're obligated to buy a few more at 'regular club prices' over a couple years. Then they also hook you in with the automatic mailings of future movies"If you want the featured title, do nothing - it will be sent to you automatically and your account will be charged." If you don't want it you have to send back a mailer to say you don't want it. The trick with these clubs is to buy the bare minimum and then quit. Otherwise you pay more per disc in the long run... probably. Who doesn't love Disney movies? Communists and fascists? They probably love em too! But is the Disney Movie Club a good deal?? Note: I'm not a member (yet) and I don't have first hand experience with the club. They also throw in a free Frozen 36" x 50" blanket when you sign up for the current promo deal. Their website has the full terms and conditions on the program. The deal I saw was 5 movies for 99¢ each. You're obligated to buy 4 movies at 'regular club prices' But in your initial order you can buy your 1st movie of the 4 you're obligated to buy for $11.95 and then another 'bonus' movie for $8.95. The first shipment has free shipping. Then you'd have to buy 3 more movies for "as low as $19.95" for DVD or $29.95 for Blu-ray. $3.95 shipping each disc. That would be $25.85 for the first 7 movies. The 3 DVDs would be $23.90 each for a total of $71.70 more or for Blu-ray its $33.90 for 3 each or $101.70. If you pay with credit card for the initial order AND authorize them to bill your CC for additional orders they give you a $3.95 discount. So you're looking at $9.36 per DVD or $12.36 per Blu-ray. So you'd pay more for just 5 movies via Amazon than you pay for 10 movies through the Disney movie club. But after you've bought the first 10 movies (7 initial order + 3 obligation) the prices on the Disney club end up higher than you'd get off Amazon generally assuming you can qualify for free shipping at Amazon. Now you can probably find some of those Disney titles cheaper elsewhere. I did a couple quick searches and found a Toy Story DVD for $10 plus $3.95 shipping and The Little Mermaid DVD for $7.88 plus $3.95 and if you want to buy from Amazon Marketplace I can find Frozen for $18.88 plus 3.99 or $22.87 while the Frozen blu-ray is $18.72 plus 3.99 or $22.71. These prices put me around $14 per DVD or $22 and change per Blu-ray. Still more than the per movie price at the Disney club. Once you've met your obligation of movies to buy with the Disney Movie Club it is probably smartest to cancel your membership. However I don't know if they then start offering promotional discount deals, like buy 1 get 1 free type deals. If they do that then you'd have to decide if those kind of deals are worth it. And this all assumes you want a bunch of Disney movies. Would you buy $100 worth of Disney movies if you didn't sign up for this club? If not then don't sign up for the club and just go buy your favorites. If you were going to buy half a dozen DVDs then it may be worth signing up since that would likely cost you north of $100 so the club will get you 10 movies for what you'd have paid for 6. Bottom Line : Yes the Disney Movie club is a good deal. However you need to be careful to only buy the minimum obligation and make sure to decline the monthly selections assuming you dont' want them. The amazon links above are commission links but the Disney club link is not. I'm not shilling for Disney, but if you wanna pay more at Amazon then feel free. DQYDJ answers the question What is the Savings Rate in Other Countries? I was wondering how much movement there is in the JD Power automotive Initial Quality Survey over longer periods. I arbitrarily decided to compare todays results with those from 10 years ago just to get a look. The 2014 IQS is on the JD power site but I found the 2004 IQS at and old USA today article. Now you can see that there are a lot of changes there. Many brands when up or down quite a bit. Overall the median change was -4 and the averages dropped 3. So the general trend is down over the 10 years but individual brands are all over the place. Wow, Porsche sure did turn around their quality! They went from near bottom to the top. Now you might be wondering how could that be? Surely Porsche quality wasn't bottom of the industry just 10 years ago. Well that brings us to an important thing about how the IQS works. For that I will refer you to the Car & Driver article The Trouble With J.D. Power's Initial Quality Study. They explain that for the JD power Initial Quality Survey, the "quality" includes design features that people may or may not like. So for example if you find the navigation interface confusing then you can get a poor quality result. Thats a design deficiency but not exactly loose screws or squeaky breaks off the factory line. When I think of car quality I think of defects in manufacturing where the car fails or breaks. However the IQS survey also adds things like complaints about features. For more detail on that read the Car & Driver article, also they show how the IQS numbers varied for a few brands over several years. They also pointed out for 2011 that : "new and redesigned machines averaged 122 problems, and carry-over or lightly modified cars and trucks scored only 103 problems" So newly designed cars with new and unproven features do worse. It would be better to look at multiple years of data and see how different car makers move up and down year to year over a longer period. That would give a better picture. Overall though I'd say the IQS should be taken with a grain of salt. Its hard to know if makers are doing poorly due to new complex features or general quality failures. I would say that if a car maker is typically at the lower quarter or typically in the upper quarter then thats a solid sign of their general quality.